Limitless winter fun for the young (and young at heart). No skis? No problem! Head to the hills for some good old-fashioned tubing and tobogganing adventures. And yes, there’s cocoa. For a jam-packed day of classic tubing, head to the Sea to Sky Gondola where you’ll find four lanes of varying sliding levels suitable for all-ages fun. After your adventure, warm up with a hot chocolate or hearty winter soup at the Sea to Sky Gondola Summit Lodge. Admission to the Tube Park is $5.00 and includes tube rentals as well as unlimited access within park hours. Note: No other toboggans or sliding devices are permitted in the tube park or at the summit of the Sea to Sky Gondola. Children under 12 years of age must be accompanied by an adult. 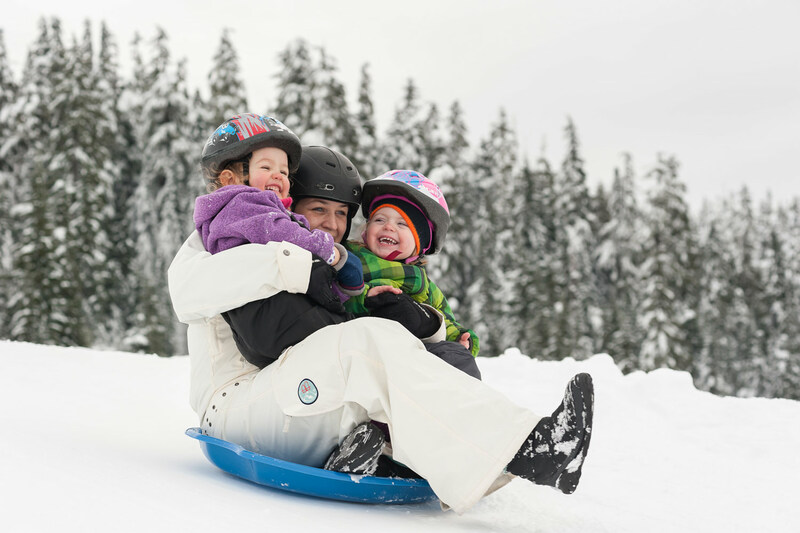 Whistler Olympic Park offers hours of all-ages family fun with one convenient pass. Enjoy the venue’s dedicated sledding hill for multiple runs on saucers, carpets or toboggans. Borrow or bring your own sled and helmet. Rentals and access to the toboggan hill are free with admission to the Park. When you’re ready to call it a day, pop into the Day Lodge for a bowl of chili or cocoa, or bring your marshmallows and warm up by the bonfire lit on weekends, holidays and Wednesday evenings. Tobogganing is free with your Whistler Olympic Park / Ski Callaghan day admission ticket or season pass. Vehicle access to the toboggan hill is $10 for the first person in the vehicle and $5 each for every extra person. Plan your visit on a Wednesday evening for the special price of $7 per carload. Note: CSA-approved helmets are strongly recommended for all sliders and required by sliders aged 18 and under. Free toboggan and helmet rentals are available at the Day Lodge. Availability is limited and a valid credit card is required for deposit. Explore the world of winter at the Sea to Sky Gondola.